In such highly networked worlds, collaboration is the new normal. The dilemma faced by Ford is between ‘developing our own technologies’ (i.e. going it alone) and ‘integrating other people’s technologies’ (i.e. collaborating), except that Bill Ford is arguing that the former approach will no longer work. A version of this dilemma experienced by a manager would be between ‘if I develop our own technology I know I’ll have a job, but it won’t be so good for the enterprise’ and ‘if I use that technology I’ll be working myself out of a job’. For the manager, other people’s technologies will be toxic to the organisation as the manager knows it, but the point made in the interview is that such thinking by the manager will be toxic to the survival of Ford. The manager’s response to what is perceived as a toxic environment is in defence of the organisation he knows, which supports his identity as a manager. Even though the ‘bad’ choice of using other people’s technology may not be dismissed directly as being toxic, it may still be excluded because it ‘feels wrong’ despite there being arguments in its favour. Choices that are felt in this way to be toxic to the organisation are killed off not by a single act of dismissal but rather by the cumulative effects of many small exclusions, micro-aggressions against forms of thinking and behaviour that are felt to be alien. The manager, in holding on to particular ways of judging what is appropriate for the enterprise, is reflecting the affect he attaches to its way of giving meaning to his work. The construction of this containing will use concepts supported by the manager’s particular ‘feel’ for what is right, the roots of which will be in his particular unconscious relation to it aka libidinal investment in that construction. Such thinking, however, can paradoxically be toxic both to his own future and to the future of the enterprise. The libidinal economy of an enterprise may thus unconsciously kill off good ideas that are essential to the survival of the enterprise. Working psychoanalytically in an enterprise to prevent such ‘murders’ therefore demands a ‘forensic’ way of working, in which careful attention must be paid to the way such dilemmas are contained, or not. This involves questioning the affects unconsciously attached to existing constructions that link them to their consequences for the enterprise – ‘forensic’ because the motives of such ‘murders’ are never obvious! The paper explores the difficulties encountered in challenging existing libidinal investment in particular ways of organising – the libidinal economy of an enterprise. To do this, it examines an example of an enterprise that stood accused of toxic thinking, in this case of institutional racism. The Governance of Specialist Care: a question of ethics? Title: The Governance of Specialist Care: a question of ethics? This paper describes a two-year intervention within an organization providing residential care for men and women with mental health disabilities. This intervention, in support of the CEO and senior management team, took place during the mid-90’s when the UK Government was engaged in de-institutionalisation, making the transition to Community Care and instituting internal market reforms. The intervention itself was concerned with supporting innovations in the way the work of the organization supported the lives of its residents. These innovations were necessary to the continuing viability of the organisation as a specialist care organisation. The paper is written from the perspective of 20 years later, making it possible to contrast the hopes and aspirations of both the consultants and the client at the time of the intervention with what actually happened to the organisation subsequently. The paper describes the way the authorisation of the consultants was drawn from the consulting approach. It describes the orthogonality that this demanded of the consultants, through which underlying dilemmas could be surfaced about the nature of the client system’s work. Three issues emerged from the intervention that are addressed by the paper: firstly, the nature and complexity of the client system in its networked environment and the extent of the innovation that this demanded (Trist 1977); secondly, the nature of the consulting approach involved in responding to this demand; and thirdly, the implications this approach had for the governance of the client system (Hoggett 2006). From the perspective of 20 years later, it is not a surprise that the social defences against anxiety won out over the desire for innovation(Long 2006). This gives rise to a fourth issue however: what change in the relationship to the unconscious was being expected of the governance of the client system, what kind of courage did this demand, and what were the unconscious dynamics underlying the Trustees’ refusal to innovate(Boxer 2013c)? The paper concludes by considering the nature of orthogonality and the change in the relationship to the unconscious that this demanded of the governance of the client system, a change that involved an ethics that could move from ‘defending against anxiety’ to ‘being true to desire’ (Lacan 1992 [1959-1960]; Lacan 2014). The paper concludes by considering the implications these ethics have for a different kind of group relations experience that can explore the existential impact of such changes, so necessary in networked environments. This paper, presented at the OPUS 2014 Conference, describes a two-year intervention within an organization providing residential care for men and women with mental health disabilities. This intervention, in support of the CEO and senior management team, took place during the mid-90’s when the UK Government was engaged in de-institutionalisation, making the transition to Community Care and instituting internal market reforms. The intervention itself was concerned with supporting innovations in the way the work of the organization supported the lives of its residents. These innovations were necessary to the continuing viability of the organisation as a specialist care organisation. The paper is written from the perspective of 20 years later, making it possible to contrast the hopes and aspirations of both the consultants and the client at the time of the intervention with what actually happened to the organisation subsequently. The paper describes the way the authorisation of the consultants was drawn from the consulting approach. It describes the orthogonality that this demanded of the consultants, through which underlying dilemmas could be surfaced about the nature of the client system’s work. Three issues emerged from the intervention that are addressed by the paper: firstly, the nature and complexity of the client system in its networked environment and the extent of the innovation that this demanded; secondly, the nature of the consulting approach involved in responding to this demand; and thirdly, the implications this approach had for the governance of the client system. From the perspective of 20 years later, it is not a surprise that the social defences against anxiety won out over the desire for innovation. This gives rise to a fourth issue however: what change in the relationship to the unconscious was being expected of the governance of the client system, what kind of courage did this demand, and what were the unconscious dynamics underlying the Trustees’ refusal to innovate? The paper concludes by considering the nature of orthogonality and the change in the relationship to the unconscious that this demanded of the governance of the client system, a change that involved an ethics that could move from ‘defending against anxiety’ to ‘being true to desire’. The paper concludes by considering the implications these ethics have for a different kind of group relations experience that can explore the existential impact of such changes, so necessary in networked environments. An individual newly joining an enterprise may experience it as a social defence system to which he or she must react and adapt. For the nurses in Isabel Menzies-Lyth’s study, “in the process of matching between psychic and social defence systems, the emphasis was heavily on the modification of the individual’s psychic defences”. A social defence system is, however, also “a historical development through collusive interaction between individuals to project and reify relevant elements of their psychic defence systems”. Menzies-Lyth underlines that the use of the organisation of an enterprise as a defence against anxiety is operated only by individuals. This approach has brought its clinical concepts, practices and focus on what enables interventions to be effective, approaching organisational entities through addressing the individual’s experience within a single enterprise, or, through the metaphoric use of psychoanalytic concepts to the enterprise itself as if it were an individual. Either way, the enterprise has been presumed to exist as a sovereign entity, paralleling the presumptions of a sovereign ego. How, then, are we to think psychoanalytically about the way in which the development of an enterprise interacts with an individual? The organisation of an enterprise used by its employees in support of their psychic defence systems is like the reef habitat used by its colonial organisms in support of their individual niches. The dynamic relationship of the coral reef with adjacent environments affects what forms of colonial organism it can support, but so too do the forms of colonial organism affect the topography of the coral reef. How does this translate into the individual-enterprise-environment dynamic? This paper considers the psychoanalytic implications of considering how cross-boundary conditions come to dominate intra-enterprise dynamics. “Affordable healthcare is a right of each citizen, not a privilege for those who can afford it.” The quote refers to the intent behind President Obama’s 2010 signature legislation, the Affordable Care Act (ACA). The struggle by the US Congress in 2013, which included the temporary shutting down of Federal Government, was part of an attempt by some Republicans to de-fund the ACA. It came as a surprise, therefore, to see the Government’s launch of the ACA website fail spectacularly, for with such a failure to innovate by Government, the citizen still pays as a taxpayer for the failure, making such failures a betrayal of the citizen’s trust in Government. Government departments, like competing enterprises, work in silos, each one trying to defend itself against competing silos in order to secure the best possible future for itself. The market assumption is that if one such silo goes bankrupt because of a failure to innovate, the impact on the wider environment may be ignored. This is not the case where there are systemic interdependencies between the silos, however, as with healthcare. How, then, can the government be expected not to betray the citizen’s trust when faced with such a complex innovation? The paper uses the case to consider the difference between social defences against anxiety and social defences against innovation, proposing that it was the latter that led to the spectacular failure. The paper’s conclusions are on the implications of this difference for working with organisations needing to innovate to survive. How do we engage, describe and work without boundaries? How do we move beyond the familiar BART (boundary, authority, role, task) view of systems? And what does it mean to take up a network approach to leadership? A recent Regional Meeting of ISPSO in London took up these questions in terms of the ‘network-coach’ discourse, based on Simon Western’s work on Coaching and Mentoring. This work very usefully distinguishes four kinds of discourse about the nature of coaching and mentoring, based on his research. This led Simon to ask me to clarify three ‘moments’ of time that, while potentially facing a person in any one of these discourses, become particularly critical in the network-coach discourse. I described my work with a CEO who started our work together by describing a particular challenge he faced: he could not fit what his not-for-profit did into the normal kinds of business planning framework – service products, markets, competitive strengths and weaknesses, 5-year cashflow prediction etc. The not-for-profit was providing intensive social care, operating in the gap between the social services provided by the UK Government and individuals’ and families’ needs. The challenge he faced was a crisis for him that had arisen because of the planning framework his Board had asked him to use, which had defined a first moment for him but which had brought about this first crisis – what the not-for-profit was actually doing did not fit the normal kind of business planning framework. The second moment involved us working together to understand what was different about the economics of his not-for-profit, about how it needed to be organised differently, and about the different kinds of relationship this demanded between its employees and those to whom it provided care. The result was a business plan that was accepted by the Board to form the basis of the next 5 years’ work by the not-for-profit, but also a second crisis – something else was needed if the not-for-profit was to develop different ways of actually behaving, a something else that was beyond any business plan. This second crisis was one in which the existing approach faces an impossibility. So with this second crisis came a crunch time. Something new was needed in the way the CEO engaged with the employees of the not-for-profit. As it turned out, this inaugurated a third moment in which a whole new challenge emerged initiating a new cycle of work aimed at addressing this challenge, but it took courage for him to accept this new challenge and ‘own’ the need to take it up. 1st moment: Accepting the stated problem/challenge and hoping that the existing approach will work. 1st Crisis: Realising that the existing approach will not work on its own. 2nd moment: Getting to grips with the details of the particular situation and adapting the approach to try to make it work. 2nd Crisis: Realising that there is a fundamental limitation to the way the approach can be made to work. 3rd moment: The persons involved put themselves ‘on the line’ in some way in order to act from something new that has the possibility of addressing the gap that has emerged. These moments of time form a cycle of learning that is only bearable if the gap can be acknowledged – not hidden behind ‘solutions’. So in this case, the CEO works with the knowledge that the gap will always be there however good the ‘solution’ appears to be, and that by remaining aware of this gap, he can work with it while looking for the next gap to appear, which in turn will need to be acknowledged and worked through. 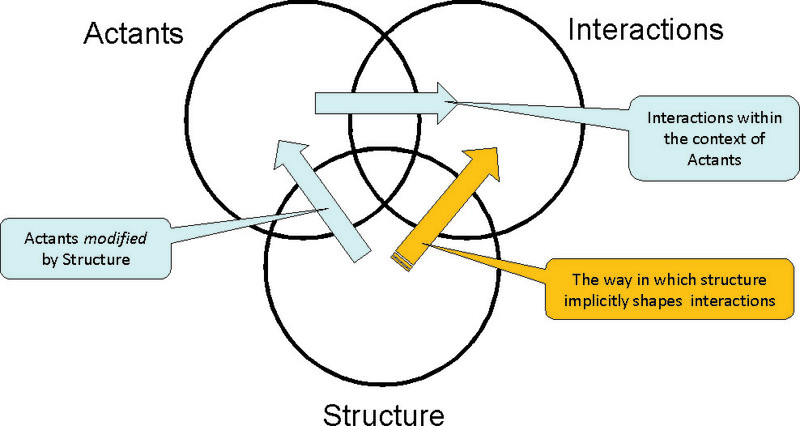 This relation to the gap is what underlies Simon’s network-coaching discourse – realising that we don’t have neat boundaries, authority, role and task, that there is always a gap, and that the network society we live and work in presents us with increasing connectivity that pushes not towards identifying authority vertically in roles, but towards addressing horizontal rhizome-like power, power that is everywhere and yet cannot be pinned down. Simon’s conclusion was that, at best, we can find quilting points that can anchor our relation to these networks for long enough to enable us to make good-enough sense and to act – until the next gap appears. Further insight into what is involved in ‘minding the gap’ may be gained by looking more closely at the second crisis. This second crisis, corresponding to the ‘nightmare’ stage in a narrative structure , is frequently where people stop. In effect, what has happened is that a person has come to the end of conscious reasoning and may even be perfectly aware that what they are continuing to do makes no sense. But something stops them from going further. It is as if a higher authority has said: “Stop. Go no further. Not another word. It’s just not possible to go any further, and you are going to have to make do with what you have.” This is like a first moment within this second crisis. If the person continues, by saying “yes, but look what is going on. Surely things can’t be left like this. There must be something more that can be done.” This time, the stunned response from the higher authority is: “What do you want? What do you expect of me? Who are you to expect more to be done. Don’t you see how much is being done already? Stop making problems.” This is the second moment in this second crisis. Now comes the crunch. If the person still continues to insist that it must be possible to do something, then the question asked of the person moves to being their own question: “what do I want? What am I prepared to do about this situation that feels so wrong. I am going to have to go beyond what I know here if I am to do something more.” This is the third moment in this second crisis that leads directly into the third moment. What does this say about the nature of the challenge faced in minding the gap? It is that this gap is experienced as a [small-d] desire to do more, to go beyond what is known in the service of doing something more. In lacanese, to ‘mind the gap’ in this sense is to take up the ethical imperative to be true to [big-D] Desire – an ethic that demands that the subject ‘pays with their being’ in the sense of putting themselves on the line in some way. Coaching and Mentoring: A Critical Text (2012) Sage. These three moments of time are based on the three moments in Lacan, J. (2006 ). Logical Time and the Assertion of Anticipated Certainty: A New Sophism. Écrits: The First Complete Edition in English. New York, W.W. Norton & Co. The instant of the glance, ibid. This is the idea that you should be able to understand just by looking. The time for understanding, ibid. This involves having to work things out by thinking things through. The reasoning depends on the framework within which it is done. For more on the challenges of surfacing the nature of this impossibility, see working on the edges. The moment to conclude, ibid. The third moment is the moment in which the ‘challenge of the case’ is taken up, a new challenge that demands that the person puts themselves ‘on-the-line’ by going beyond what they know in choosing to take up the new challenge in their behaviour. These points of anchorage are ‘points de capitons‘ in Lacanese. For more on this, see “Betraying the citizen: social defences against innovation.” (2015) Organisational & Social Dynamics 15(1): 1-19. The reasoning behind these three moments within the second crisis comes from a session given during the course of Lacan’s XXVI 1978-79 seminar series on 8th May by Alain Didier-Weil in “A new theory of the Superego”. Didier-Weil, A. (1979). Nouvelle théorie du Surmoi. Book XXVI – Topology and Time. J. Lacan. unpublished. This paper describes a two-year intervention within an organization providing residential care for men and women with mental health disabilities. This intervention took place during the time when the UK Government was engaged in de-institutionalisation, making the transition to Community Care and instituting internal market reforms. The paper draws conclusions for consulting practice in the light of events during the course of the following five years. The intervention itself was concerned with supporting changes in the way the work of the organization supported the lives of its residents. Three issues emerged from this intervention: firstly, the nature and complexity of the client system in its context and the challenge this presented; secondly, the consulting approach involved in responding to this challenge, and thirdly, the implications the approach had for the governance of the client system. The paper’s conclusion considers the implications of the change in the relationship to anxiety that was being expected, and the kind of courage that this demanded.